We welcome your interest in the Master of Science in Finance Program. The Master of Science in Finance Program (M.Sc.) is a thesis based program that provides students with a theoretical background in contemporary finance issues and a strong foundation in empirical research methods. The first year of the two-year curriculum is devoted to course work while the thesis is the second year focus. Due to the research intensive nature of the program and individual student supervision at the thesis stage, applicants are carefully adjudicated and enrolment is limited. Only a handful of universities across North American offer programs that have a similar research focus at the Master’s level. The degree can be used as a platform for students who wish to pursue a Ph.D. and it equips students with a competitive advantage in jobs that have a significant research component. The ideal candidate will have completed an undergraduate degree in finance with excellent grades. The applicant must also supply a statement of purpose, GMAT and TOEFL (where applicable) scores, three letters of reference, and a resume or curriculum vitae. In special cases we consider applicants with a strong quantitative background and a more limited exposure to finance and economics. The fundamentals of estimation and inference in the classical regression model, with applied laboratory sessions using actual economic data. Topics covered typically include: multiple linear and non-linear regression models; least squares; maximum likelihood; instrumental variables; statistical properties of estimators; asymptotic theory; restrictions; measurement error; serial correlation; heteroskedasticity; systems of equations. Provides students with a fundamental understanding of the current issues of interest in research in the modern theory of corporate finance. It provides students with a theoretical background in areas such as firm theory, security issuance, capital raising, capital structure, and corporate governance. Presentation and discussion of articles from academic journals are used as tools to enhance student learning. Develops investment theory through the financial economics framework of Von-Neumann Morgenstern utility. This allows exploration of risk aversion, stochastic dominance, and portfolio optimization. MPT and CAPM are derived. Arrow-Debreu contingent claims and option pricing theory are addressed. Additional topics include risk-neutral valuation, stochastic discount factors, and the consumption CAPM. Presents a critical look at current financial models and gives the student experience in the systematic analysis of financial data. Students are exposed to a suite of analytical tools that allow rigorous assessment of the characteristics of financial data and models. This course considers the financial concepts required to invest in fixed income securities. Topics include the mathematics required to evaluate fixed income cash flows, measuring and hedging fixed income portfolio risk, the yield curve in theory and practice, repurchase agreements, interest rate forward agreements, futures contracts, swaps, and mortgage-backed securities. A forum in which faculty members, visiting professors, and M.Sc. students will present research papers. All students participate in FIN 990. Beginning in year two of their program, students are required to do a minimum of two presentations per academic year. Students undertaking research must register in this course each year until completion of the program. A research project serves as the primary tool to learn econometric techniques, but is augmented by a consideration of the theoretical aspects of econometrics. Deals selectively with the theories, strategies, and applications of derivative securities. Topics include futures and forward contracts, swaps, standard options, exotic options and other derivative securities on different underlying assets; valuation techniques; empirical studies; governance and regulation of derivative securities trading and exposure; and management of financial risks. Starts out with the classic Miller-Modigliani irrelevance theorem, which describes a frictionless financial markets set-up. Various deviations from this set-up, particularly with respect to agency costs, information asymmetries, and taxes, are then introduced. Students will also study how these market imperfections affect firms’ dividend policies and capital structures. Involves analysis of the problems, opportunities and questions confronting the financial management of multinational enterprises. Consideration is given to macro aspects of international finance including the problems of international liquidity and related institutional developments as inputs to the financial decision making of multinational enterprises. Students work closely with the instructor and review several academic journal articles in the area of global legal institutions, global corporate governance, global ownership structures, global cost of capital and capital structure. The focus of this course is portfolios: portfolio analysis, selection, and management. Selected theories behind optimal portfolio construction and management are presented. Important general equilibrium models are derived and followed through the literature. The theoretical and empirical validity of these models is assessed. It is geared towards students who intend to broaden their knowledge in Financial Institutions beyond the knowledge of undergraduate studies and who may intend to work in the area of financial institutions in their thesis. This course will introduce papers which uses specialized methods used in this area of research in addition to papers that cover the current interesting area of research. Gives students practical experience in the acquisition, managing, and monitoring of investment securities and entry and exit decisions with an application to managing the funds held in the Investment Account of the Student Managed Portfolio Trust (SMPT). Students will develop skills related to managing a group of financial analysts to compare and contrast the relative merits of investment opportunities among different industries and asset classes. The legal and ethical considerations of investing will be emphasized throughout. GSR 961 is an online course that you complete through Course Tools (Blackboard). This is a required course for students interested in doing research on human subjects. Introduces students to the ethics of research with human subjects. Students will complete the Tri-Council Policy Statement: Ethics Conduct for Research involving Humans (TCPS) Tutorial and become familiar with the human ethics processes at the University of Saskatchewan. The electives listed above are what a typical student takes but is not an exhaustive list. Under the discretion of the program director and/or your thesis supervisor, alternative electives can be taken from other departments such as Economics, Law, Math and Psychology. These courses comprise the basic structure for the fundamental development of your M.Sc. program of study. Depending on the academic background some students may be required to take ECON 804 in term 1 & 2 of the first year before taking ECON 808 in term 1 of year 2. Thesis: The investigation of risk in Sin stocks. Thesis: Role of Board of Directors in Corporate Governance. Thesis: Effective Mergers on Efficiency of Community Banks. Thesis: The Impact of the CEOâ€™s Religion on the Merger and Acquisition Deal. Thesis: CEO Overconfidence & Information Overload. Thesis: : Mergers and Acquisitions. Thesis: Institutional Ownership & CEO Gender. What makes the MSc degree at the University of Saskatchewan unique compared to other MSc in finance programs is the requirement of students to perform original research which they must defend before an examination committee. Successful completion of the final defense will require that the research project be completed to the satisfaction of the student's supervisory committee which, in most cases, will consist of the academic supervisor as the chairman, two other faculty members from within the department, and an external examiner selected from outside the department. The transition from coursework to thesis is often the most difficult stage in the program as students may have difficulty in determining a topic that is appropriate for the thesis. Faculty will often have ideas that may be used as thesis topics. Students are therefore encouraged to familiarize themselves with the faculty and the research that is being conducted by them. To facilitate this process, brief faculty-student meetings will be arranged as required to determine the compatibility of students’ ideas and faculty research. You do not have to select a supervisor before you enroll in the MSc Finance Program at Edwards. Instead, in your first year of study, you will be matched with a supervisor based on your area of interest. All students who are accepted into the MSc program are matched with a supervisor. Applications for September 2019 have now closed. Applications for September 2020 will reopen in October 2019. The Edwards MSc in Finance assesses applicants on a composite basis for admission purposes. We look at a variety of factors when making admission decisions including undergraduate degree, grade point average, research interest, GMAT score, and reference letters. An interview may be required. Applicants must have a four-year undergraduate degree in business or a related field with a major or substantial number of courses in finance from a recognized university. Applicants must have a cumulative weighted average of at least 75% in the last two years of study (i.e. 60 credit units). Unofficial transcripts from all post-secondary institutions that you have attended must be uploaded to your application. Transcripts from the University of Saskatchewan do not need to be uploaded, but are required from all other institutions you have attended. For countries where degree certificates are issued, they must also be uploaded. If accepted, an official transcript of your academic record is to be sent directly from each institution attended. Please note that applicants are required to have taken at least 6 credit units of Statistics and 3 credit units of Calculus. All applicants wishing to enter the program are required to write a GMAT or GRE exam. GMAT - The minimum accepted GMAT score is 500 (a score of 600 or higher is recommended, due to competition for limited space in the program). This test can be written at major centres throughout the world. For information on test centre locations, the nature of the exam, and scoring procedures, please visit the GMAT website. GMAT scores are valid for five years from the date the test is taken. The Edwards MSc in Finance requires you to submit 3 confidential letters of recommendation, from professors or others or others that you have studied under. Contact your referees and ask them to provide a reference for you for the Edwards MSc in Finance program, and obtain an up to date email address. Your letter of intent is a chance to tell the Edwards MSc in Finance Selection Committee what unique and valuable contributions you can make to the program. Provide a brief description of your business and educational background, and your goals for the future. How will an MSc in Finance help you achieve your goals? Describe briefly what your research interests are. Discuss why you have decided to apply to the Edwards MSc in Finance program, and why it is a good fit for you. What specific parts of the Edwards MSc program are you looking forward too? Make sure your letter of intent is unique and specific to the Edwards MSc in Finance program. 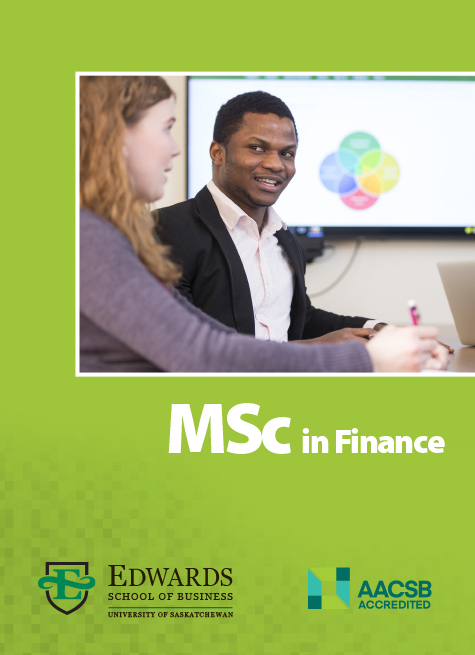 We don't want to read generic letters that sound like they could have been sent to any school; We want to know why you have chosen the Edwards MSc in Finance, and why we should choose you! Outline your previous education and work experience (if applicable) so the selection committee can have a good understanding of your background. *The standard length of the MSc in Finance program is 2 years, although some students take longer to complete. If a student takes longer than two years to complete, they will be assessed appropriate tuition going forward. There are currently no scheduled recruitment events.